JACKSON, Miss. 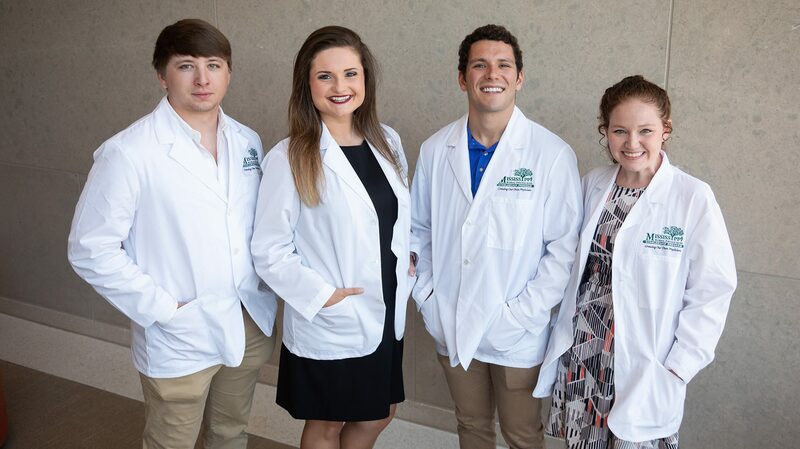 – University of Mississippi seniors Conner Ball, Megan Buchanan and Steven Smith, and junior Katelynn McGowen, have been selected to participate in the undergraduate portion of the Mississippi Rural Physicians Scholarship Program. Ball is the son of Janyce and Scott Ball, of Madison. Buchanan is the daughter of Terri Buchanan, of Collinsville. Smith is the son of Brian and Denise Smith, of Terry. McGowen is the daughter of Hugh and Robin McGowen, of Moselle. Created in 2007, Mississippi Rural Physicians Scholarship Program identifies college sophomores and juniors who demonstrate the necessary commitment and academic achievement to become rural primary care physicians in the state. The program offers undergraduate academic enrichment and a clinical experience in a rural setting. Upon completion of all medical school admissions requirements, the student can be admitted to the UM School of Medicine or William Carey University College of Osteopathic Medicine. During medical school, each Mississippi Rural Physicians Scholarship Program scholar is under consideration for $30,000 per year, based on available funding. Consistent legislative support of the Mississippi Rural Physicians Scholarship Program translates to 60 medical students receiving $1.8 million to support their education this fall. Additional benefits include personalized mentoring from practicing rural physicians and academic support. Upon completion of medical training, the scholars must enter a residency program in one of five primary care specialties: family medicine, general internal medicine, medicine-pediatrics, obstetrics/gynecology or pediatrics. The program scholar must provide four years of service in a clinic-based practice in an approved Mississippi community of 15,000 or fewer population located more than 20 miles from a medically served area. The Mississippi Rural Physicians Scholarship Program provides a means for rural Mississippi students to earn a seat in medical school, receive Medical College Admission Test preparation, earn a $120,000 medical school scholarship in return for four years of service and learn the art of healing from practicing rural physicians. For more information, contact Dan Coleman, MRPSP associate director, at 601-815-9022, jdcoleman@umc.edu or http://mrpsp.umc.edu.